Lois Hubbard, 90, formerly of The Long Community at Highland, Lancaster, PA and Alliance, OH, passed away on Wednesday, September 12, 2018 at Ware Presbyterian Village, Oxford, PA. She was born in Clay Township, Butler County, PA to the late Harry B. and Clara G. (Wolford) Schlosser. 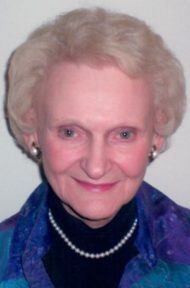 A graduate of Alliance High School, Lois attended Eastern Nazarene College in Wollaston, MA. She was the wife of the late Wilbur A. Hubbard. Lois owned the House of Travel, which she operated with her family, in Alliance for 28 years. As a travel agent, she was fortunate to explore the world and visited a total of 63 countries during her lifetime. She loved The Lord and was very devoted to her church. Lois worshiped and served on the board at First Church of the Nazarene in Alliance, OH. Over the years Lois served as choir director, Sunday school teacher, church missionary president and district missionary president. She always enjoyed hymn music and singing. Later in life she was also a member of The Chapel in Green, OH and The Worship Center in Leola, PA.
Lois is remembered as someone always willing to lend a helping hand to anyone in need. In Alliance, she was involved in the Rotary Club, and was recognized as a Paul Harris Fellow. She served as Chapter Board Chairman of the American Red Cross in 1990 and 1991, and was active in the American Society of Travel Agents, YWCA, Women’s Division, and the Chamber of Commerce. Even while living with Alzheimer’s at Ware Presbyterian, she ministered to fellow residents in her unit. Lois had a very strong love for her family. Surviving family includes her sons, Warren Hubbard and Paul Hubbard (Stephanie), both of Alliance, OH, her daughter Lynnette Spadea (Vincent), Lititz, PA; 6 grandchildren, Rachel Mack (Joel), Shaina Mack (Ezekiel), Jason Hubbard (Kate), Erin Hreha (Matthew), Brittany Barnhart (Jesse) and Courtney Wait (Jon) and11 great-grandchildren. In addition to her husband Wilbur, Lois was preceded in death by her siblings Kathryn Frazier, Margaret Giovanelli, Floyd Schlosser and Warren Schlosser. A viewing will take place at 9am Monday, September 17th, followed by the funeral service at 10am at the Cassady-Turkle-Christian Funeral Home, 75 S. Union Ave., Alliance, OH 44601. Interment in Highland Memorial Park, Beloit, OH. Memorial contributions may be made to Willow Tree Hospice, 616 E. Cypress St., Kennett Square, PA 19348 or to Ware Presbyterian Village, “Chapelwood Neighborhood” in the memo, 7 E. Locust St., Oxford, PA 19363 or flowers can be sent to the Cassady-Turkle-Christian Funeral Home for Monday, September 17th.